The bi-annual meeting of the World Intellectual Property Organization (WIPO) Standing Committee on Copyright and Related Rights (SCCR) took place last week in Geneva. Teresa Nobre and Alek Tarkowski participated in the meeting on behalf of Communia, which has observer status. We were particularly interested in the debate on exceptions for education. As Communia, we have until now focused our policy work on the European Union (albeit we were present at WIPO, as observers, briefly for debates on the public domain in 2012). We decided to start attending SCCR meetings in order to address the issue of good copyright for education also at global level. We hope that we can contribute to set out a global education exception. In Geneva, we joined a broad coalition of civil society organizations and groups, and representatives of public interest institutions such as libraries or archives that have been participating in these meetings. Our particular focus is on education, an issue that until now has not been strongly represented by civil society observers at WIPO. We are hoping to change this situation. Delia Browne, who represented Creative Commons as a representative of Creative Commons Australia, joined us at the meeting. The issue of exceptions and limitations to copyright has been on the WIPO agenda for years. In 2013, the Marrakesh Treaty was signed, requiring all WIPO members to provide a domestic copyright exception that allows the creation of accessible versions of books and other copyrighted works for visually impaired persons. The exception secured by the treaty is an important win, and a clear evidence that a global copyright standard that supports public interest can be established through the WIPO process. Currently, the SCCR is conducting debates that concern potential exceptions in two further areas: libraries and archives, and education. The debate on libraries and archives is more advanced, and at recent meetings the discussion concerned particular provisions and issues related to such an exceptions. Education is the second area, and the debate on this issue is much less developed. In both cases, SCCR is discussing issues that have potentially huge implications for the public interests related to the rights to education and access to knowledge. provisions on educational reproduction, broadcast, communications and recordings usually do not include remuneration. During the discussion, Teresa Nobre asked several questions – we appreciate the answers provided by Prof. Seng. – Prof. Seng stated when asked if the countries analysed are offering to their educators and students the same educational freedoms provided by international treaties, or if they are being less flexible, covering less uses, protecting less beneficiaries than the treaties would allow them. Thank you, Mr. Chairman. I speak today on behalf of Communia, the International Association for the digital public domain. We advocate for policies that expand the public domain and increase access to knowledge and culture. Mr. Chairman, I would like to use the opportunity to thank you for the Chair’s Chart on exceptions and limitations for education. We hope that it will be useful in charting a fruitful discussion, as has been the case with exceptions and limitations for libraries and archives. We would like to propose translations and other adaptations as an additional topic. We believe that copyright policy needs to empower—and not thwart—the activities of teaching and learning. We need a harmonized standard that ensures that copyright is fit for modern education—which spans the lives of learners, and takes place in a variety of formal and informal settings, online as well as off. An argument is often made against the introduction of an internationally harmonized educational exception that stresses the specificity of national educational systems. Yet this argument is rarely substantiated. And at the same time the right to education is universal, guaranteed by article 26 of the Universal Declaration of Human Rights. The ability to access and use content is a crucial condition for fulfilling this right. National educational systems vary indeed, to a great extent. But differences in curricula, funding or certification do not provide any justification for variance from the universal right to education and, basing on it, to the basic right to use copyrighted works in an educational context. We would like to remind that the WIPO Copyright Treaty “recogniz[es] the need to maintain a balance between the rights of authors and the larger public interest, particularly education”. We hear all the time from publishers: local educators, local curriculum, local materials. We agree, but only provided that we also place at center stage the universal right to education is universal. We note that the argument about the importance of local specificity is in fact an argument that applies to the educational publishing ecosystem. It is within the scope of copyright policy to provide a right balance that will support authors and content creators, in particular in the educational sector. But we need to distinguish the educational publishing ecosystem from the broader sphere of education that encompasses this ecosystem. Public interest is ultimately about good education, and publishing is only means to this goal. From the perspective of public interest, copyright law needs to support the right of education, around the world. We also would like to note growing importance of cross-border education, such as distance learning or MOOCs. We need to make sure that copyright supports, and does not hinder such modern education. 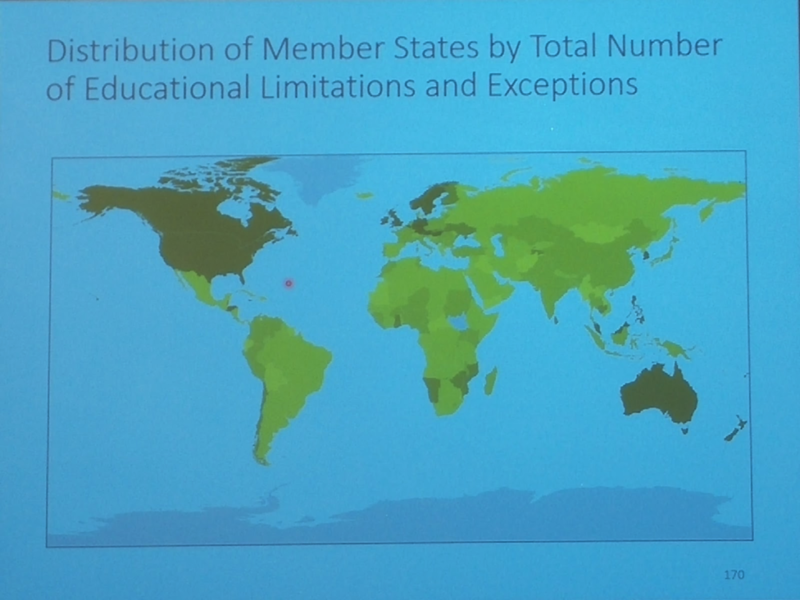 Professor Seng’s study shows the great range of educational exceptions and limitations around the world. In some states, strong and modern educational exceptions support teachers and learners, some even are fit for the digital age. In these states, the sky did not fall, education is thriving without prejudice to authors, publishers and rights holders. In other states, educational exceptions are weak or non-existent. Educators face a complicated patchwork of rights that covers a limited range of resources, or limited uses. They teach and learn in a grey zone that does not provide legal certainty, and teachers and learners are often burdened with navigating this copyright maze on their own. There are multiple cases, where teachers and students face prosecution because of using content for the purpose of learning. This is not acceptable. We argue that for copyright law to support the universal right to education, we need to set international, mandatory, minimum standards for limitations and exceptions. Such standards can never be achieved by dependence on licensing, as it provides no clear standard and often burdens the educational systems with high licensing costs. We also note great importance of open norms to securing these goals. Protect the overriding of exceptions through contracts. We note that many states already implement these rules. We hope that the Committee will progress on developing this standard. We thank the Committee for its work and offer our assistance in future debates. This entry was posted in event reports, general, international policy and tagged education, wipo. Bookmark the permalink.